The day after the housewarming, we were invited to a friend's house for dinner, and I had the great idea that I'd bring dessert, despite the epic night before. All day long I was tossing up between different desserts I could prepare ahead - blueberry blintzes and apple pie were at the top of my list, but I then realised apple pie would be a safer choice and went and bought all the ingredients. Then I got home and realised that, indeed, I still don't have a rolling pin and pastry was out of the question. D'oh! 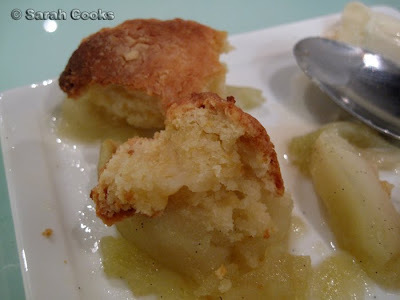 Then I thought that I could try apple cobbler! (One of those rustic American puddings - similar to a grunt, a slump, a crumble...) I have made Nigella's Red Slump before, but I wanted something totally covered in crunchy topping goodness, not sparsely dotted. 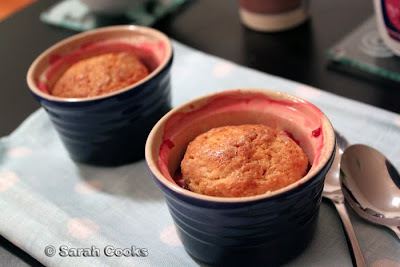 I used a recipe from Smitten Kitchen, substituting apples for her rhubarb. 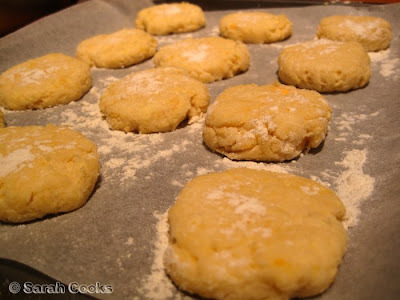 Deb's recipe is a pretty standard scone dough, and I used Jamie Oliver's "grate the butter" tip to make it easier. Well, I say "standard", but it did have one unusual ingredient... hardboiled eggs! I've never seen hard-boiled eggs used as an ingredient in baking, but apparently it makes the finished product cakier and sandier. Deb's version looked pretty damned delicious, so I was happy to give it a go. You just grate them into the flour and rub the butter in as normal. Once the dough disks were formed, I stashed them in the fridge (I think you're supposed to leave them for a few hours but I didn't have time), and cooked up the apples. I peeled, cored and chopped some granny smiths, and cooked them in a pan with some butter, castor sugar and the seeds of a vanilla pod. As they were going in the oven afterwards, I just let them soften around the edges, not cook through. Then it was time to go! 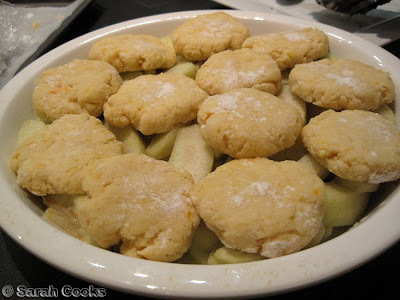 We put the apples in a tupperware container, gladwrapped the dough discs on the tray, and took them, and a pie dish, across town to our friends' place. I assembled the cobbler whilst Zachy was putting the finishing touches on dinner (it was roast pumpkin risotto and beetroot/feta/chickpea salad! ), and shoved it in the oven just before we sat down to eat. Woah! I love how much the dough discs expanded and rose! Huge biscuit-to-fruit ratio, just the way I like it! But if you are not a biscuit-fiend, then definitely up the fruit. Juicy fruits (actual fruit, not the chewing gum) would be particularly suitable - the dough can definitely accommodate! We had it with vanilla ice-cream, perfect. 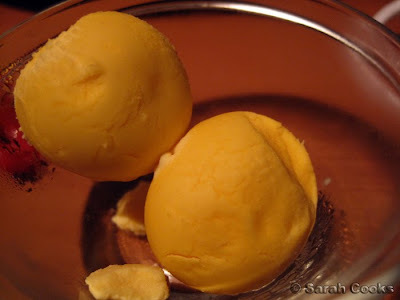 I was a little nervous about the hardboiled egg, but apart from a golden colour, you really couldn't tell that there was anything unusal about the dessert. Mmm... hot cakey apple goodness. 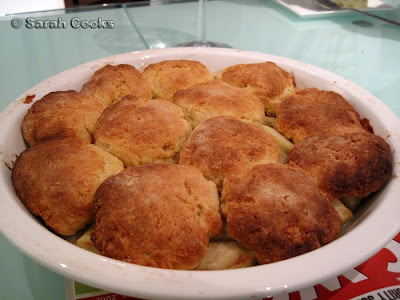 As you can see, I only needed 12 dough discs to top the cobbler... the rest were stashed in the freezer for a rainy day. That 'rainy day' came in the form of a real rainy day, a couple of weeks after. It was cold, I was hungry. I didn't need any more encouragement to get the cobbler discs out! I also had some frozen berries in the freezer, so used them as well. I chopped up a granny smith apple, mixed the pieces with the frozen berries and a good amount of sugar. Don't forget, frozen berries are SOUR! My old chef used to tell me that the preservatives they use on the berries exacerbate their inherent sourness. I put the fruit mixture into 2 little ramekins, topped each with a little frozen dough disc, and shoved them in a hot oven for 20 minutes. Et Voilà! I didn't have any ice-cream, so we ate the cobblers with a generous spoon of thick cream. 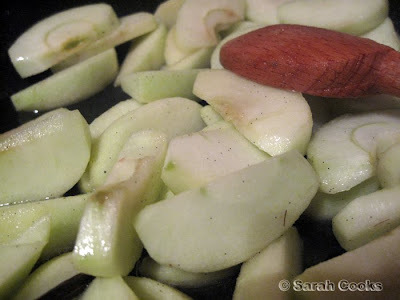 The filling was lovely, and a bit of a surprise - the apple pieces I used really took on the raspberry flavour and colour, so much so that you couldn't taste the apple very much at all. A great way to eke out expensive berries! 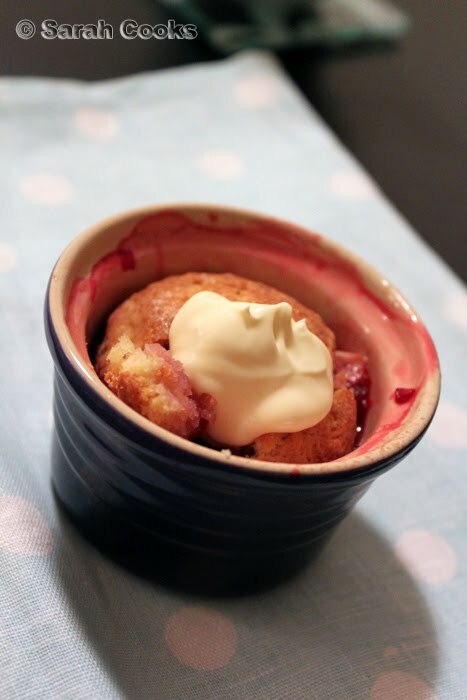 I didn't realise until I started eating that I was unconsciously re-creating a scone, in hot pudding form. Think about it - hot crunchy scone topping, raspberry studded jammy soft filling, and cold thick cream. Like, wow. Cobbler is a lot easier to make than scones though, and there no performance anxiety about it looking perfect. Just quietly, I may even like this dessert better than scones. Eep! 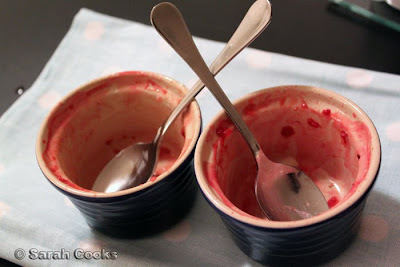 I'd forgotten how winter-perfect cobbler can be - I always tend to think of crumbles. And I never imagined freezing the dough, but that's *perfect* for me right now. I've just moved out and usually am cooking for just me, so a handy individual dessert is awesomeness! Let's hope that this is fool proof for me! It has been crazy cold lately and cobbler does seem to be the right solution. I love the look of that cobbler, must try to knock one up too.